Supported Device List click here. 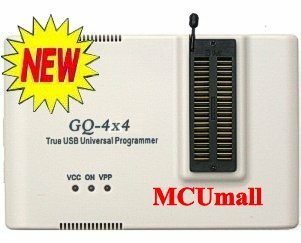 GQ-4x4 is the newest model of True USB Willem Universal Programmer series from MCUmall Electronics Inc Canada. Support O/S: Windows XP,Vista,7,8,8.1,10 in both 32 bits and 64 bits Windows. The application-oriented & application-enhanced design facilitates GQ-4x4 supports thousands of most popular application devices (growing) and ideally suits the portable/convenient applications that includes: car automative field ECU chiptuning, airbag reset, mileage, satilite devices, BIOS refreshing, motherboard BIOS in-circuit upgrade, xBox,Wii gaming machines EPROM duplicate, Altera Xilinx JTAG, PIC/MCU development, newer laptop technology and newer desktop PC etc. GQ-4x4 features the same data interface as GQ-4X, GQ-3X, the True USB data transmission with PC/LapTop.